Bessette Lawn & Landscaping has been installing quality lawns across Central Connecticut since 1992. We pride ourselves on the quality of our workmanship. We only use the highest quality materials and tools to ensure the finish of each and every project is the best it can possibly be. Every lawn installation is different and in order to deliver the best results we will provide you with our methods for a transparent approach to delivering quality time and again. When you build a house you ensure the foundations are laid, laying your lawn is no different. If you don’t carry out the correct preparation then you will not get the finish our customers demand. At Bessette Lawn & Landscaping a typical installation will include several stages of preparation including renovation, scarifying and fertilizing the ground before we rake it level then supply a high quality cultivated lawn turf to a flat and level finish. If your budget cannot stretch to the immediate results of a new lawn, then we also offer an alternate solution, seeding. 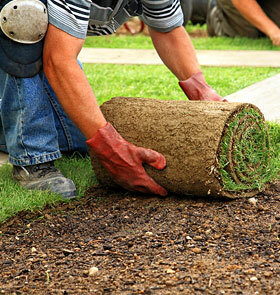 Preparation for a seeding installation will match that of a turf installation. High quality seed mix will be used to deliver a great lawn on a smaller budget. from the professional, eye for detail, customer focused attributes that makes us Bessette Lawn & Landscaping.